TRUMPF announces a new, updated C Series press brake line. 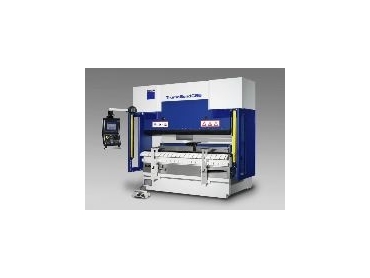 Designed as an introductory level machine, the C Series is equipped with many of the essential performance features of TRUMPF's signature V Series press brakes, but in a package intended for customers whose material processing or capacity requirements warrant only a basic machine. "The C Series offers our customers the benefits of TRUMPF bending technology in an entry-level package," says Mike Morissette, product manager of the bending and punching groups at TRUMPF Inc. "The C Series was designed for easy, cost-efficient bending in situations where more advanced performance options are unnecessary." The new C Series features an increased bending area, more rigid construction, optional Bendguard to ensure safe bending, a programmable backgauge, 4-cylinder ram drive, and a unique crowning system. The innovative four-cylinder drive concept minimizes beam deflection and results in precision quality bends. The passive crowning system compensates for beam deflection. The controlled beam incline enables bending at several stations throughout the entire bending length. The precise, flexible CNC backgauge ensures optimum part quality and saves time with quick travel speeds and no required setup time for the X and the R axes. The self-centering TRUMPF tool adapter is another timesaver. Adding to their versatility, C Series press brakes can be equipped to accommodate any style of press brake tooling available on the market. There are currently two models available in the C Series, a C 66 press brake rated at 74 tons with 82 inches of bending length and a C 120 rated at 135 tons with 122 inches of bending length. The C 66 and C 120 can be configured with a 2- or 4- axis back gauge, and come standard with manual bed crowning. Like the V Series, the C 66 and C 120 offer Y1/Y2 dual axis ram control with precision +0.0004 inch repeatability. A high level of precision is built into the design of the new C Series machines. The machine frames are made of high-strength steel and are calculated using FEM (finite element method). After they have been welded, they are annealed, sandblasted and painted with multiple layers. A large bending clearance makes it easy to bend even large or complex parts and provides the flexibility needed to work on a wide variety of parts. Side doors and rear roll-up gates facilitate access the machine's interior and save floorspace. The CNC backgauge ensures the precise position during the bending process. Trumpf is brought to you by Headland Machinery .